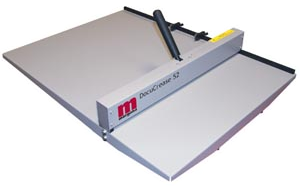 The AutoCreaser Pro series , made in the UK by Morgana, provides the complete solution to the problem of cracking that occurs when creasing digitally printed output. The creasing and scoring machines are equally effective dealing with conventionally printed card, laminates or cross-grained stock. 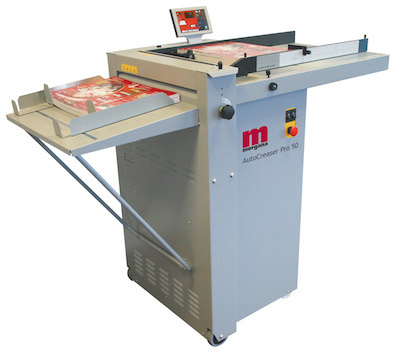 The AutoCreaser, made in the UK by Morgana, provides the complete solution to the problem of cracking that occurs when folding digitally printed output. The AutoCreaser provides the complete solution to the problem of cracking that occurs when creasing digitally printed output. 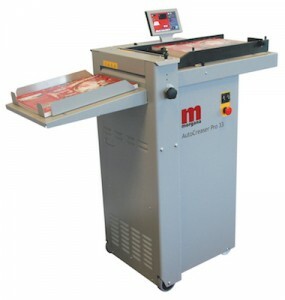 52cm hand creaser designed for small volume applications, the Morgana DocuCrease is a hand operated machine, which has adjustable stops for multi creasing down the sheet. This creasing action is a process proven to eliminate cracking of the most difficult materials. Applications such as creasing glossy covers, stocks or materials with the grain running in the wrong direction prior to folding or booklet-making, cover stocks that have been produced by litho or digital printing processes using toner or ink, Christmas or greeting cards, invitations, menus, laminates or covers prior to thermal adhesive binding. The DigiFold Pro is an automatic creasing and folding machine that can perform both creasing and folding in a single pass. Or use as a stand alone creaser when folding is not required or use as a perforator when creasing and folding are not required. The fast touch screen set-up allows the user to enter the required fold type and sheet length and then it automatically sets the creasing and folding positions ready to run the job.